Carlos Manuel Bocanegra (born May 25, 1979) is a retired American professional soccer player. A two-time MLS Defender of the Year, Bocanegra also played professionally in England, Scotland, France, and Spain. He earned over 100 caps with the United States, serving as captain for six years. He is currently serving as technical director and vice president for Atlanta United. Bocanegra was born in Upland, California on May 25, 1979, to Manuel and Kelly Bocanegra and raised in Alta Loma, Rancho Cucamonga, California, where he attended Alta Loma High School. He has one brother, Diego, who played soccer at Grand Canyon College and attended UCLA in 1995–96. His father is of Mexican descent. While attending UCLA, Bocanegra studied history and geography. Prior to attending UCLA, Bocanegra was offered scholarships for American football but opted for soccer, which he thought of choosing as his career. He was inducted into the UCLA Athletics Hall of Fame in 2013. After playing college soccer at UCLA, Bocanegra signed a Project-40 contract with Major League Soccer and was drafted by the Chicago Fire with the fourth overall pick in the 2000 MLS SuperDraft. He spent most of the year with the Fire, playing two games on loan with Project 40. He proceeded to win the MLS Rookie of the Year Award for a team that made it to the MLS Championship match and won the Lamar Hunt U.S. Open Cup. He became one of the top defenders in MLS, becoming the first player to win the MLS Defender of the Year Award twice, in 2002 and 2003. Bocanegra scored five goals and had eight assists in his four years in MLS. Bocanegra was signed by Fulham in January 2004, quickly becoming a fan favorite, garnering the nicknames the Jackal and the Black Snake. With Fulham, Bocanegra played primarily as a center back, but also as a left back and briefly as a holding midfielder. During the 2006–07 Premier League season, he was Fulham's second leading scorer with five goals, behind fellow American Brian McBride. On September 1, 2007, Bocanegra captained Fulham for the first time in a Premier League match, a come from behind 3–3 draw with Tottenham Hotspur. On September 15, 2007, he made his 100th appearance in the Premier League, all for Fulham, against Wigan Athletic. He was released by Fulham on May 23, 2008. Bocanegra was signed by Rennes in June 2008. He received the number 3 shirt, which is his number for the United States. Bocanegra performed well in his first season in France, appearing in all 38 league matches. He scored his first league goal on March 8, 2009, in Stade Rennais's 2–0 victory over Auxerre. He also scored a goal in a UEFA Cup match and started all the club's Coupe de France matches. These included the 2009 Coupe de France Final at the Stade de France on May 9, 2009, where he scored Stade Rennais' first goal against Guingamp, in the 69th minute. On July 16, 2010, Bocanegra was purchased by fellow Ligue 1 club Saint-Étienne for a reported fee of £400,000. He wore the number three shirt, as he did captaining the U.S. during the 2010 FIFA World Cup. Bocanegra made his debut for the club, on the opening game of the season, in a 3-1 loss against PSG. On December 5, 2010, he scored his first goal for the club, in a 2-2 draw against Bordeaux; followed up his second goal in the Derby du Rhône, but couldn't helped Saint-Étienne a win, as they lost 4-1. Bocanegra would be often used in first team ins and out in his first season. In a match against Nice, on October 17, 2010, Bocanegra suffered whiplash injury, that kept him out for three weeks. In the 2011-12 season, Bocanegra took the captaincy temporarily following Loïc Perrin absent, on the opening game of the season, as Saint-Étienne win 2-1 against Bordeaux. This turned out to be his only appearance. He was linked with a move to Rangers, but was warned by Saint-Étienne that there are not to sell him. On August 17, 2011 Bocanegra joined Scottish Premier League side Rangers, signing a three-year deal for an undisclosed fee. Bocanegra made his debut for Rangers against NK Maribor on August 18, 2011 in a UEFA Europa League qualifier. His involvement in this match later caused controversy when Maribor filed a complaint to UEFA regarding the eligibility of Bocanegra's appearance, questioning whether he had the required clearance and paperwork. The protest was rejected by UEFA on August 24 as Maribor did not submit it within twenty-four hours of the match. The club's chief later described the complaint by Maribor regarding Bocanegra's eligibility as 'pathetic mischief making'. He scored his first goal for Rangers in the second leg of the Maribor tie as Rangers crashed out 3–2 on aggregate. Bocanegra scored his first league goal for the club on the 24th of September against Dunfermline Athletic in a 4–0 win. His second goal came three months later, on December 17, 2011, during a 2-1 win over Inverness Caledonian Thistle. Bocanegra quickly became a fan favorite after a series of solid and impressive performances alongside his center-back partner, Dorin Goian. He was nicknamed Captain America by the Rangers fans and captained Rangers for the first time on January 8, 2012, during a 4–0 win over Arbroath in the Scottish Cup. During the season, Rangers went into administration over financial problems and a dispute with HMRC, leading to a 10-point deduction. Bocanegra spoke about the event, describing it as a "horrible experience" and encouraging players to light up the dejected fans. He also stated his desire to stay at the club, insisting he was happy there. During an "Old Firm" 3-2 victory, on March 25, 2012, Bocanegra received a straight red card after fouling Georgios Samaras, conceding a penalty. After Rangers FC went into liquidation in June 2012 the company's assets, including the players' contracts, were purchased by Charles Green's consortium. Although many players departed because of this, Bocanegra's future was uncertain after not attending training, as he wanted to leave in order to play at a higher level. A few weeks later, on July 29, 2012, McCoist appointed Bocanegra captain for the first round of the Challenge Cup- a 2-1 win over Brechin City. After the game Bocanegra announced his intention to stay, vowing not to walk away from the club. He then made six appearances at the start of the season. After being dropped by the national team, Bocanegra joined Racing de Santander on a season-long loan in an attempt to keep his international career alive. On August 31, 2012, Bocanegra joined Spanish Segunda División side Racing Santander on a season-long loan. Bocanegra expressed a desire to return to Rangers once his loan deal has expired. He made his debut for the club, on September 22, 2012, in a 1-0 win over CD Mirandés. However, his time at Santander was "disastrous", as he failed to start the remainder of the matches, though still played regularly, coming on as a substitute. The club was relegated to next division. On April 9, 2013, Carlos announced on his Twitter page that he would return to Rangers for the 2013–14 season. Though announcing his return, U.S. National Team Manager Jürgen Klinsmann warned Carlos not to play for Rangers next season. In the summer of 2013, Bocanegra left Rangers and signed with Chivas USA. Chivas USA traded up the allocation order with Toronto FC to land his signature, sending a first-round 2015 MLS SuperDraft pick and an international slot to the Canadian club. Bocanegra retired at the end of the 2014 MLS season. Bocanegra played for the United States at the 1999 FIFA World Youth Championship and earned his first senior cap for the U.S. on December 9, 2001, against South Korea. He became a stalwart for the team in 2003, solidifying his position during the 2003 Gold Cup and leading all defenders with thirteen appearances during that year. During World Cup qualification in 2005, his role with the national team became less clear, as he bounced between roles at center back and left back. On May 2, 2006, Bocanegra was named to the United States World Cup roster for the tournament in Germany. He started two of three games at left back during the 2006 World Cup. Bocanegra was first-choice captain of the U.S. squad under manager Bob Bradley. Bocanegra captained the national team for the first time in a 4–1 U.S. victory in a June 2, 2007, friendly against China. Bocanegra captained the United States national team that defeated No. 1 ranked Spain to win one of the 2009 FIFA Confederations Cup semi-final games on June 24, 2009. He then continued his leadership duties throughout the 2010 FIFA World Cup, starting at left back against England and Slovenia and then as the left-center back against Algeria and Ghana. On November 15, 2011, Bocanegra joined the 100 cap club achieving his 100th international cap in a friendly against Slovenia. In March 2013, Bocanegra was initially included on the preliminary team for the start of the final stage of World Cup qualification; he did not make the final team however. Bocanegra's further exclusion from qualification, in part due to his unstable club situation, led to the appointment of Clint Dempsey as captain of the USMNT. Bocanegra was subsequently not a part of the team at the 2013 Gold Cup or the 2014 World Cup. Bocanegra was appointed technical director of Atlanta United in March 2015. In October 2017, he signed a new four-year contract with the club, which also added the title of vice president to his role. He was appointed to co-chair the Technical Development Committee at U.S. Soccer in April 2018. As of December 15, 2014. ^ Wilson, David. "Carlos Bocanegra: Happy Cinco De Mayo, Gringos!". ^ "Exclusive interview: Carlos Bocanegra, Rangers' well-travelled defender, on Rabbie Burns, positivity and how football wasn't his first choice". Herald Scotland. January 25, 2012. Retrieved July 6, 2013. ^ "2000 MLS Project 40". ^ "Fulham match preview". www.whufc.com. Archived from the original on August 19, 2010. Retrieved September 30, 2010. ^ Braine, Matthew (September 17, 2007). "Americans in England: Deuce on the Loose". goal.com. Archived from the original on February 20, 2008. Retrieved November 27, 2013. ^ "Bocanegra heads Fulham clear-out". BBC Sport. May 23, 2008. ^ "Ligue 1: Rennes beat Auxerre, La Havre win". ^ "Carlos Bocanegra has been sold to Saint-Etienne « Over There". ^ "OFFICIAL: USA Defender Carlos Bocanegra Joins Saint-Etienne". Goal.com. July 16, 1010. ^ "Bocanegra makes debut for Saint-Etienne". Vegas Insider. August 7, 2010. Retrieved July 6, 2013. ^ "Bocanegra out three weeks" [Bocanegra out trois semaines] (in French). L'Equipe. October 19, 2010. Retrieved July 6, 2013. ^ "American Exports: Altidore strikes in AZ debut". MLS Soccer. August 7, 2011. Retrieved July 6, 2013. ^ "St Etienne warn Gers off Carlos". Sky Sports. August 17, 2011. Retrieved July 6, 2013. ^ "Rangers sign Bocanegra". SPFL. August 18, 2011. ^ "Rangers ace Dorin Goian: I'm not worried about being partnered by new boy Carlos Bocanegra in Maribor". Daily Record. 18 August 2011. Retrieved July 6, 2013. ^ "Maribor's Carlos Bocanegra protest thrown out by Uefa". BBC Sport. August 24, 2011. ^ "Rangers brand complaint over Carlos Bocanegra 'pathetic mischief making'". Daily Record. August 25, 2012. Retrieved July 6, 2013. ^ "Rangers 1–1 NK Maribor (agg 2–3)". BBC Sport. August 25, 2011. Retrieved November 27, 2013. ^ "SPL: Dunfermline 0 Rangers 4". Daily Record. September 25, 2011. Retrieved July 6, 2013. ^ "SPL: Rangers 2 Inverness 1". Daily Record. December 18, 2011. Retrieved July 6, 2013. ^ "Rangers stopper Carlos Bocanegra: I don't regret move to Glasgow even though administration has been horrible experience". Daily Record. May 25, 2012. Retrieved July 6, 2013. ^ "Ranger star Carlos Bocanegra: Players want to help raise spirits of our fans during difficult time". Daily Record. February 15, 2012. Retrieved July 6, 2013. 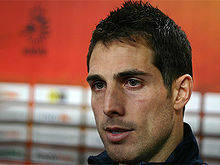 ^ "Carlos Bocanegra: I want to stay at Rangers because I'm happy here". Daily Record. April 27, 2012. Retrieved July 6, 2013. ^ "Rangers 3 - 2 Celtic". BBC Sport. March 25, 2012. Retrieved July 6, 2013. ^ "Rangers: Players attend Murray Park for fitness tests". BBC Sport. June 28, 2012. Retrieved July 6, 2013. ^ "US stars set to depart lowly Rangers". Fox Sport. July 11, 2012. Retrieved July 6, 2013. ^ "Ramsdens Cup: Brechin City 1-2 Rangers". BBC Sport. July 29, 2012. Retrieved July 6, 2013. ^ "Carlos: I may not walk away from Rangers". Evening Times. July 30, 2012. Retrieved July 6, 2013. ^ "Rangers duo dumped by their national sides". Daily Record. August 14, 2012. Retrieved July 6, 2013. ^ a b "Rangers: Carlos Bocanegra joins Racing Santander on loan". BBC Sport. August 31, 2012. Retrieved July 6, 2013. ^ "Carlos Bocanegra's Spanish move on brink of falling through". Daily Record. September 6, 2012. Retrieved July 6, 2013. ^ "The sum Racing Anduva his third consecutive win (0-1" [El Racing suma en Anduva su tercer triunfo consecutivo (0-1)] (in Spanish). Real Racing Club de Santander. September 22, 2012. Retrieved July 6, 2013. ^ "Carlos Bocanegra Official Twitter account". Twitter. Retrieved July 3, 2012. ^ "Klinsmann advises Carlos Bocanegra against Rangers return". Goal.com. April 24, 2013. Retrieved July 6, 2013. ^ "Rangers in crisis: Ibrox star Carlos Bocanegra admits he's keen for a return to MLS". Daily Record. July 9, 2012. Retrieved July 6, 2013. 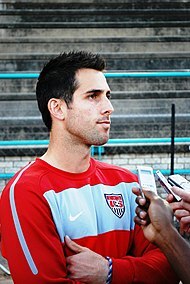 ^ "Ex-USMNT captain Carlos Bocanegra joins Chivas USA, returns to MLS after near decade in Europe". MLS Soccer. July 1, 2013. ^ "United States captain and MLS veteran Carlos Bocanegra retiring". espnfc.com. September 4, 2014. ^ "Longtime USMNT fixture Carlos Bocanegra announces retirement from soccer". mlssoccer.com. September 4, 2014. ^ "World Cup 2010 – Carlos Bocanegra". BBC Sport. Retrieved September 5, 2011. ^ "Former USMNT, MLS star Carlos Bocanegra named technical director for MLS Atlanta expansion club". MLS Soccer. March 2, 2015. Retrieved June 18, 2018. ^ "Atlanta United signs Technical Director Carlos Bocanegra to 4-year contract extension". MLS Soccer. October 9, 2017. Retrieved June 18, 2018. ^ Roberson, Doug (April 19, 2018). "Bocanegra takes on new task within U.S. Soccer". The Atlanta Journal-Constitution. Retrieved June 18, 2018. ^ "Captain Carlos: Bocanegra Reflects on his Captaincy, Memorable Moments and What it All Means to Him". U.S. Soccer. May 31, 2011. Archived from the original on June 3, 2011. This page was last edited on 13 March 2019, at 16:37 (UTC).